(above) The Medical Federation of Peru's Julio Vargas says, "The stoppage ... will require the cooperation of all doctors." LIMA, Peru (CNN) -- Doctors in Peru started a 48-hour strike Tuesday over pay and other benefits they say the government agreed to last year but has not delivered. 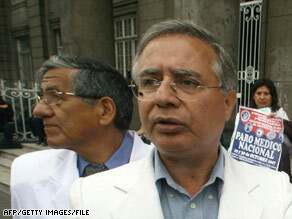 The Medical Federation of Peru's Julio Vargas says, "The stoppage ... will require the cooperation of all doctors." The doctors' union, the Medical Federation of Peru, called the strike after meeting Monday with Prime Minister Yehude Simon, news sources reported. "The stoppage that we will implement ... will require the cooperation of all doctors and that they suspend their external consults, although we will reinforce intensive and emergency care," union President Julio Vargas was quoted as saying in El Comercio newspaper. Health Minister Oscar Ugarte said the government has complied with all the agreements reached last year and the doctors have no reason to strike, RPP radio reported. Ugarte also warned doctors they will not be paid while on strike, the Andina news agency and El Comercio said. "You can't stop working and later come and say, 'Pay me,' " Ugarte said in El Comercio. "That is immoral and does not conform with professional ethics." At issue are pay for special work and more equal pay among state doctors, the news reports said. Salaries for doctors in Peru have decreased to one-fourth of 1976 levels, The Lancet professional medical journal reported in May 2008. As a result, physicians often hold two or more jobs to make ends meet. An average doctor's salary in Lima, the capital, is the equivalent of $670 a year, The Lancet said. A 2007 survey of 202 interns in Lima showed that 38 percent were thinking about migrating to a developed country to practice medicine, the publication said. Salary was one of the main reasons given.